I'll start this off with a free font. I'll add some more as time goes by. There's also a collection of desktop images from my old site which I'll upload soon. 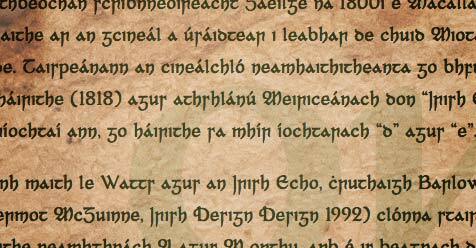 As well as Watts and the Irish Echo, similar historical fonts were created by Barlow, Christie, Fry and Figgins (Dermot McGuinne, Irish Type Design 1992). They are characterised by unusual uppercase A and M glyphs, which are almost blackletter in appearance. As per the original, it's a single weight with no italics. Click here for a type specimen and download links.